Cut the beef across the grain into thin slices. Mix marinade ingredients and soak beef in it for several hours (for the most flavor). Boil broccoli and brown beef in oil. 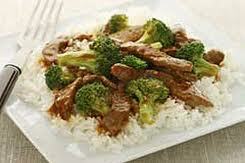 After beef is cooked through add garlic, broccoli, and oyster sauce. You can add more soy sauce or water to thin it out, if needed. Salt to taste, serve with rice and enjoy!